With his opponent on his chest or back in ring, the attacking wrestler climbs to the top rope and, facing forward, somersaults off the top turnbuckle spinning 450 degrees in the air before landing on his opponent in splash position. 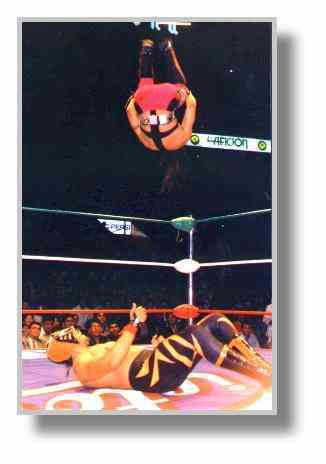 Juventud Guerrera is among the most famous wrestler in Mexico using the move, which is typically reserved for match finishes. It's a tricker move, with wrestlers having issues rotating to the correct position before impact. A modified version is known as the Phoenix Splash. This page was last edited on 15 December 2016, at 03:38.